With the nice weather we had been having I thought this recipe would have to wait until this fall to make an appearance here. But Mother Nature has a mind of her own and it turned off really cold over the weekend. 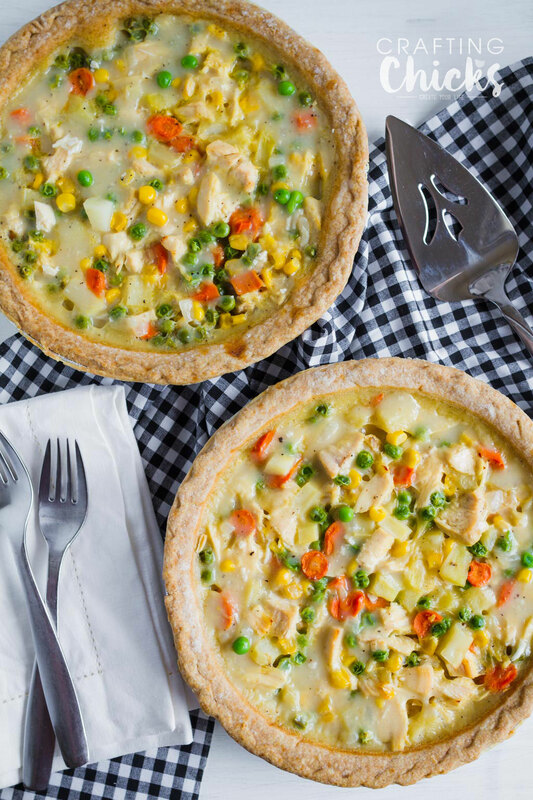 Cold enough for Chicken Pot Pie. I’ve been making this version for years and it is in the top 5 of my husband’s favorite dishes. 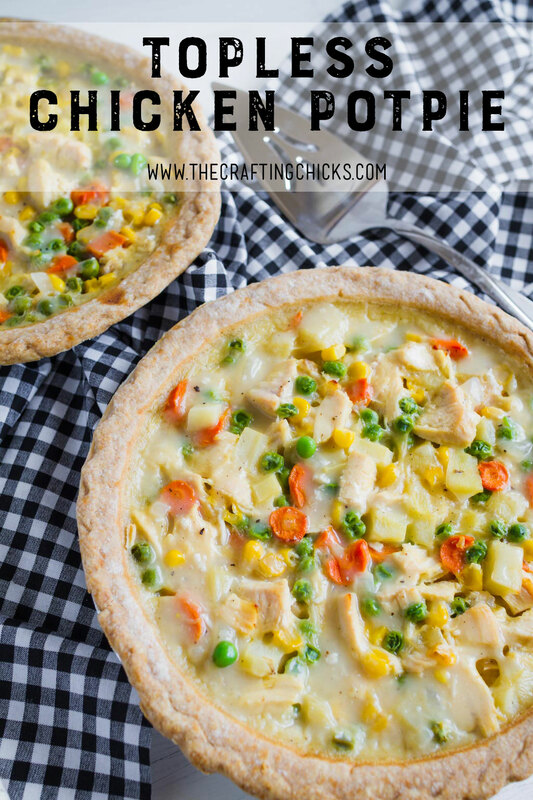 I cheat and use store bought deep dish pie crusts. 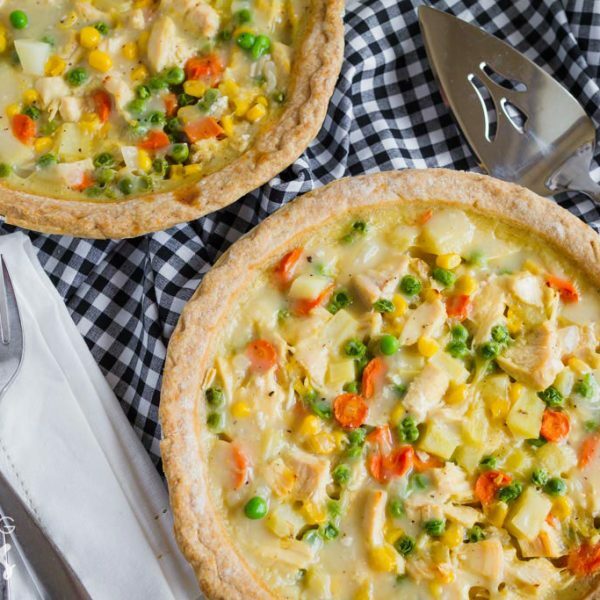 This recipe makes twice as much as our family eats, so I like to take one into a neighbor for dinner or freeze one of the pies for later. First, sautee carrots and onions in butter until the onions are translucent. While the carrots and onions are cooking, go ahead and chop up a potato or two. 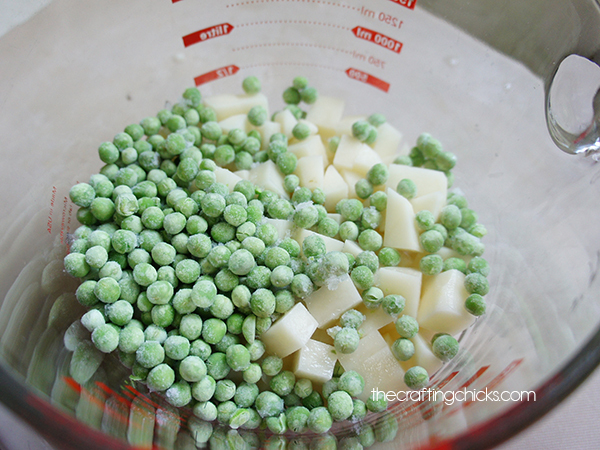 Through in some frozen peas to get us a little closer to 4 cups. 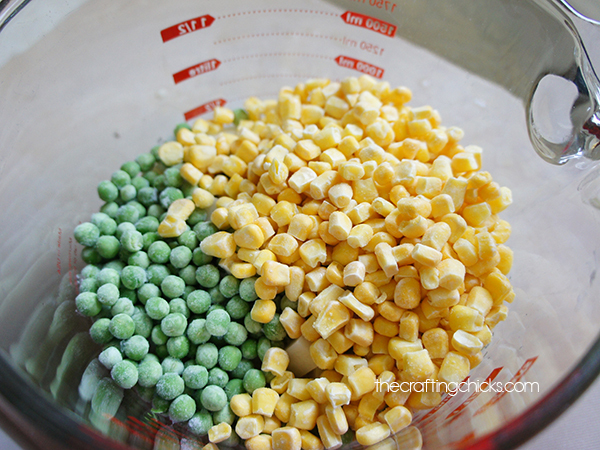 And then add enough frozen corn to bring the potatoes + peas + corn measurement to 4 cups. I love the smell of cooking onions. See how they have softened up and are turning translucent here? 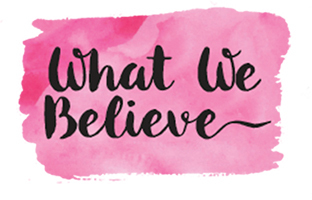 That’s what we want. 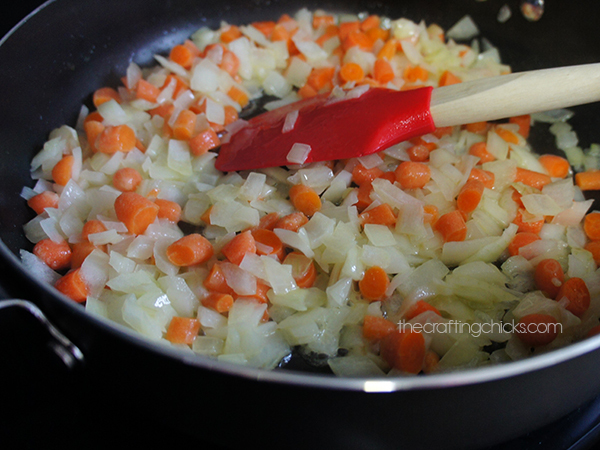 Sprinkle 1/2 cup of flour over the carrots and onions. 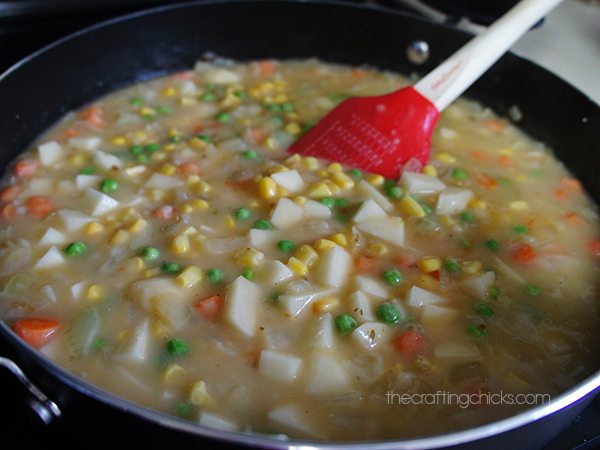 Stir until the flour is mixed with the butter and coats the vegetables. Then add in the stock and base. Add in the half and half (I use 1% milk most of the time and no one notices) and cook until bubbly. Then add in the chicken. 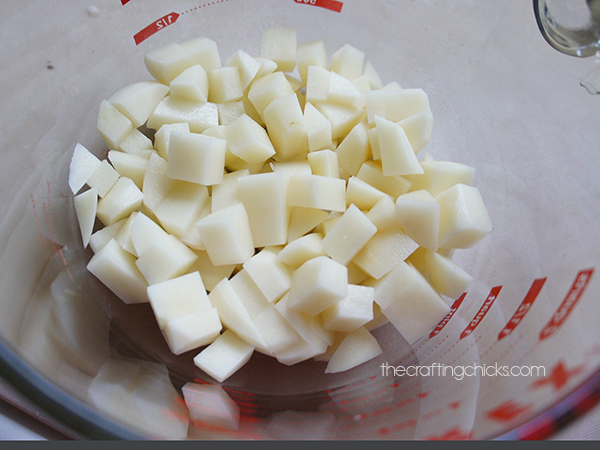 Diced chicken breasts would be great, but I normally use canned chicken because it is faster. And getting this in the oven is the name of the game. 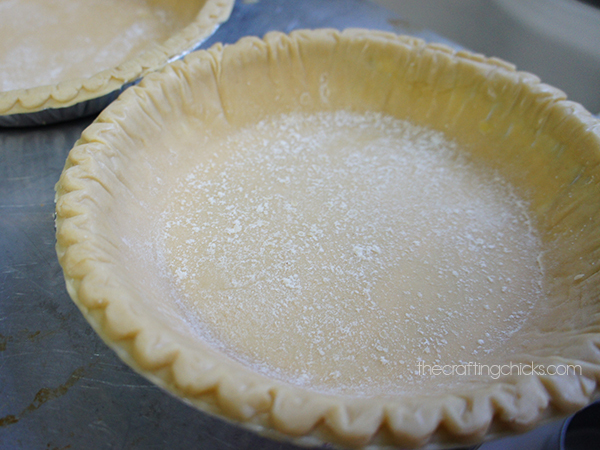 Take 2 deep dish pie crusts and position them on a cookie sheet to catch any spills. 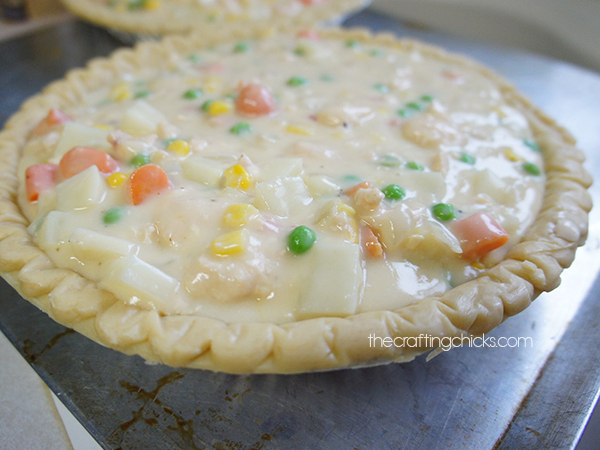 Fill the pie crusts and slide the pan into the oven. Since we only eat one pie, I wrap the other in foil and freeze it for a later meal after it comes out of the oven. It is also a great comfort meal to share with friends who had a baby. 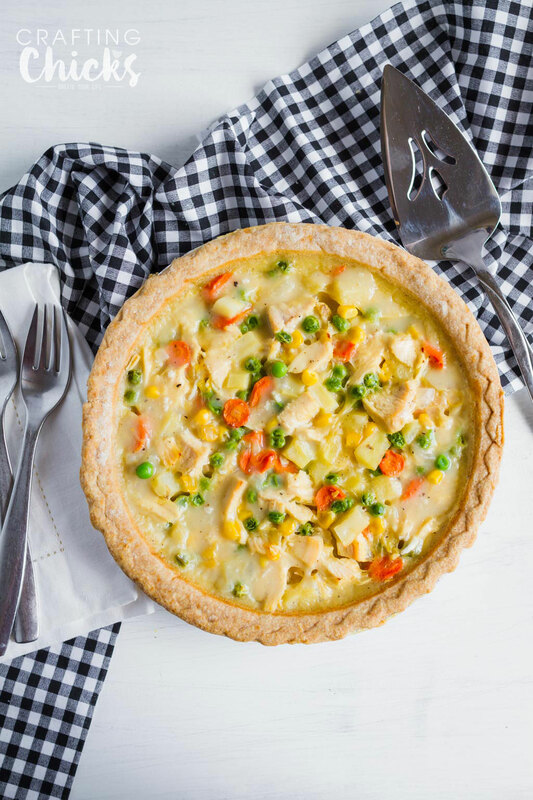 This Chicken Pot Pie recipe is homemade goodness. Comfort food that will make bellies full. 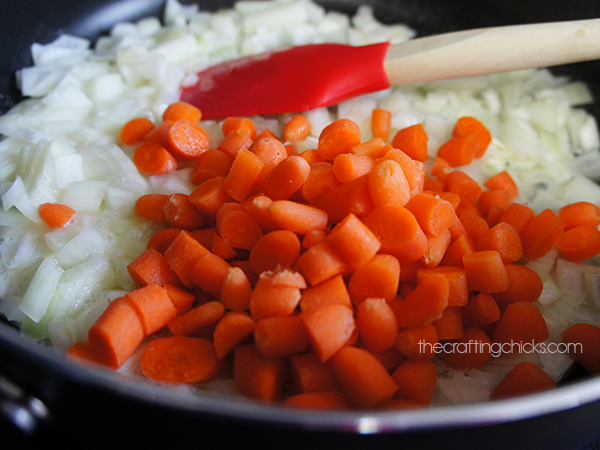 Saute onions and carrots in butter until onions are translucent. 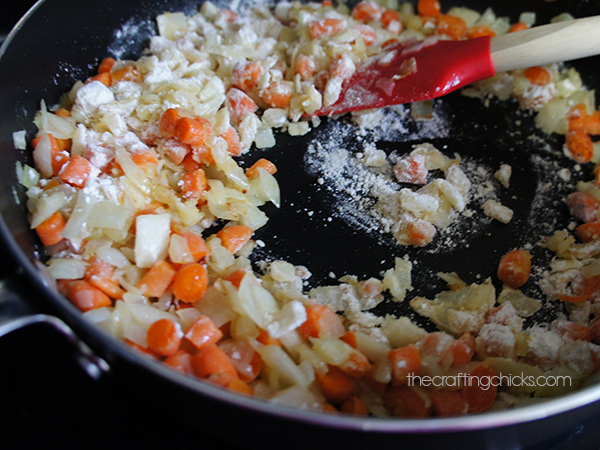 Sprinkle flour into carrot, onion and butter. Stir and cook for 1 min, creating a roux. 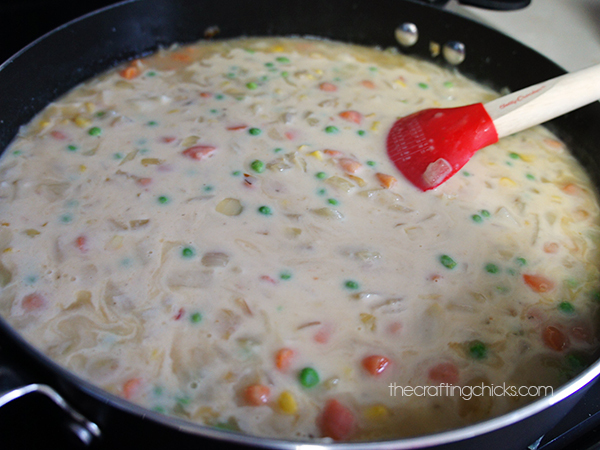 Add chicken broth, half and half, chicken and vegetable base. 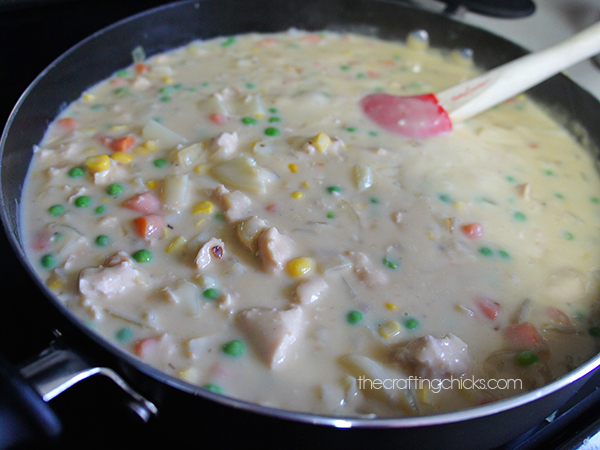 Cook until bubble then add chicken, peas, corn and potatoes. Pour into pie crusts and bake at 350 for 1 hr. YUM! I love your “open faced” twist on a classic! This looks yummy. I prefer to do a “bottomless” pot pie. You get a nice crispy top but no bottom. I actually just use milk in place of the half and half. Half and half is half cream. You can use stock for the broth and you’ll need 4 cups of diced chicken after the fresh chicken has cooked. Probably 3 chicken breasts? Enjoy! Made this a few weeks ago…ate one and froze the second…having it today! So good! Definitely a keeper!!! How do you cook the frozen one? thaw then bake? Or just put it straight in the oven from the freezer? I am making these tomorrow! I would like to know the same thing, how did you cook the frozen one?